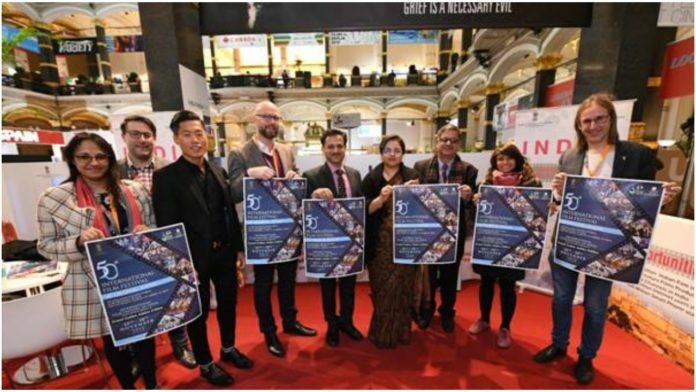 The India Pavilion at the Berlin International Film Festival (Berlinale) 2019 was inaugurated by Director European Film Market, (EFM) Matthijis Wouter Knol. The dignitaries also inaugurated the poster of IFFI 2019 during the inaugural ceremony. Speaking on the occasion the Director of EFM said that the stakeholders of EFM would actively consider participating in the Golden Jubilee year of IFFI. He also marked that in the future the participation would gravel a way forth for a more proactive the communication between Indian stakeholders and the Industry with the organizers of Berlinale. The Deputy Chief of Mission, Mrs Tripathi in her statements said that the Indian Mission in Berlin would undertake constant engagement in future with Indian and German stakeholders at the European Film Market to promote a viable exchange in all areas related to participation in IFFI 2019 and the Berlin Film Festival along with working towards widening prospects of shooting of films in India. Members of the Indian delegation including Addl. DG, Directorate of Film Festivals, Shri Chaitanya Prasad and Director, Films, Ministry of I&B Shri GC Aron informed the EFM representatives about the importance of Golden Jubilee celebration of IFFI, the recent changes made by the government for Indian filmmakers, single window clearance, a web portal for online application and amendment to the Cinematograph Act to tackle film piracy. Paramita Tripathi, Deputy Chief of Mission, Embassy of India in Berlin and Peter Domsch, Head of Sales & Technical Department, EFM also graced the event by their presence.